Blessed Treehouse: One year and 264 posts later. 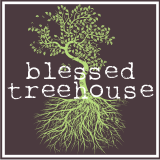 I started blogging at Blessed Treehouse one year ago today. I have thoroughly enjoyed chronicling my year through words and pictures, and I can only wonder what the next year has in store for my Blessed Treehouse. Thanks for following along on this journey. Without y'all, I don't think I'd still be doing this, honesty and truly. I love your favorite too. I think Aunt MoMo should go back and watch all your vlogs for your Blogiversary.